In my point of view, the BLOGGING is the real deal for any website; whether the website is written just for fun or with the purpose of making money online, a blog is the best way increase the traffic and so the sale. With the blogs, the blogger can share the latest happening, tech reviews, knowledge sharing with the people. Blogging help creating more conversation with the target audience. Moreover, it helps in establishing the relationship with the targeted audience so as to create an authority figure and so the domain authority. Many new bloggers used to ask; how I improve my blogging? How to develop self as a professional blogger? How can I increase my blog traffic? How do you get visitors to your blog? How do I get more followers on my blog? How do you develop a blog? How make money blogging works? Blog and website are two different things, a blog is the part of the website of the business. Blog performs a necessary role in shaping the authority in that particular niche. There are lots of benefits associated with the quality blogging. Quality blog pages result in increased traffic to the website. Those can be turned into a permanent customer for the products or services the website deals with. As a blogger, it can be a monetary career that can bring handsome money every month. Whatever the purpose behind the blogging, its the first thing that you need to write an evergreen quality blog pages. In order to make the blog reach more and more target audience, it is essential to keep the focus on its improvement. There are several factors needs to be considered while improving the blog. Only updated, trending, and latest blog can turn into a big deal for the bloggers & online publishers. So, it is immensely important to improve its quality and visibility for any blogger and their blogs. Today, it is very hard for the business to survive in this world of internet and online shopping. The business having quality blog websites can able to run efficiently. It is the blog that makes the business to form a right picture in front of the customers and target audience. it is thus necessary for the business to pay attention and concentrate on the blog and its quality. Let us focus on how to improve the blog. With the following tips, you have improved blog at the end of the process that ultimately resulting into the increased traffic for the content and so the improved monetary returns in your pocket. The best way to connect with the audience is by establishing the personality. It is important to let the people know the person behind the blog. Even though you are blogging for business sake, it is necessary for the visitor to know the human behind the words. It is necessary to have keyword rich blog posts. With quality and preferably targeted long tail keywords, it can help you to improve the quality of the blogs. Adding targeted keywords help you to improve domain authority fast. It is ideal to have self-hosted blogs. You can build a popular blog on Blogger(. )com or on the WordPress(.)com. But if you build a self-hosted blog then you can enjoy more control on its professional look. The self-hosting blogs shows you are serious about blogging. The heading is the first thing that usually converts visitors into the readers. It is necessary to spend more time on framing the headline for the blog post. The readers first read the headline. If your headline is catchy then only it becomes successful in grabbing the attention of the readers. So, it is recommended to design the headline that is catchy, understandable and visible. 5. Build the content on the trending ideas. To improve your blog, you can build a blog on top proven but trending ideas. The first of all, you need to find out the most popular and trending content that already generated a lot of traffic and shares. You can select the related topic and can build on top of it. You can create a new content too, based on the similar topic that can bring it to a new level than that of original content. 6. Blog for customer satisfaction. You must blog with practical use. People are more interested in the content that can answer their questions or solve their queries. The blogs offering explanations and helpful tips always rocks. 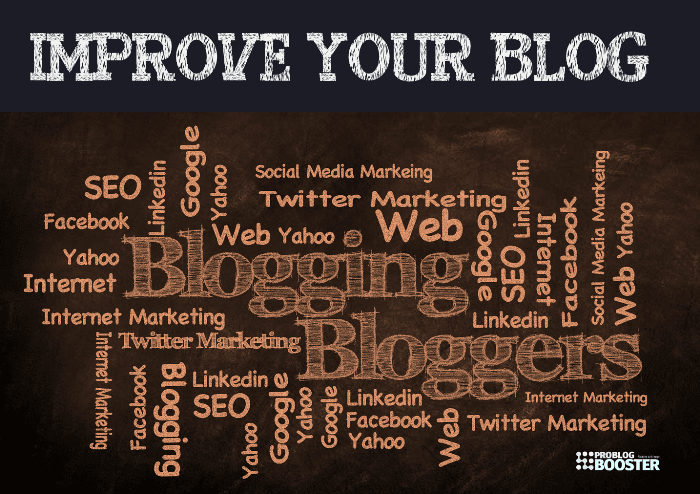 Such blogs gain popularity as they possess practical benefits. 7. Design the content catchy & interesting. The content needs to be attractive, interesting and appealing to the target audience. In order to improve the content, always tend to make it more impressive one. Don't forget "Content is the KING". You need to go yourself to your customer to show what you publish. Until and unless you make your blog pages public it will have fewer chances to get read your pages by wilful traffic. It is obvious that if the content is shared through social platforms, then only they can get viewed by the public. So, publish them on different social platforms, emails, etc. 9. Add sharing options for all of your readers. You can add the share button on the website or blog. So that, the readers can share the content with their friends. In order to improve your blog, it is necessary to build a solid network of like-minded people. The active and concrete network will help you to improve your blog quality through the suggestions you get from the readers. Such kind of network attracts more advertisers and sponsors, that will further help you making money blogging. Having a Google authorship is always worthy for the online writers. Google authorship not only helps to deserve the credit but also helps to catch the attention of the searchers. This, in turn, increases the traffic for the blog posted. Today, the mobiles have become the popular gadget for the online presence of the people. It is ideal to design the blog that can be mobile friendly. Make sure that the web design is responsive especially on the smart gadgets. Moreover; now the Google is started considering mobile-friendly design; you may read in details at; What is Google’s Mobile-First Indexing? Why Its So Important? How To Prepare? To improve your blog and to improve traffic, it is a great way to promote the work of established and reputed writers. Guest blogging can be a great way to improve your blog. 14. Content with your authority figure. Try to build yourself as an authorized person like a brand. It is very important to create an outstanding content that can establish yourself as an authority figure. There are chances that the blog might get down. It is recommended to have regular schedule backups of your work. 16. Set up comment systems. Adding extended comment systems like Disqus will help you to eliminate the content spam and help to improve your blog. 17. Make a to-do list and follow work calendar. It is ideal to have your own to-do list for making the blogging work easy and a work calendar to schedule when to publish the post. It is good to list down the type of posts you are going to publish (interview, personal, epic, reader questions, etc.). Check the stats regularly. Analysis how your reader acts on the different topics, and find out what kind of content your followers want from you and your blog. You can list and publish your best post and impress the more and more visitors. This can encourage the visitors to connect with you on social media if they not able to find the answers to their queries. The contact page will not only help to improve the quality of your blog but the trust. 20. Keep updated "About Me" page. The "About Me" page is the most frequently visited page for any kind of blog and is thus plays important role in improving your character as a writer-blogger and so the blog. 21. Add signing up page. Many other online publishers always looking for the authority sites to post their pages for a backlink; you can improve your blog by attracting quality post of other bloggers. 22. Scheduling promotions and marketing tasks. It is necessary to have a proper schedule of your promotions. You need to keep an eye on prime time for all your social sharing likes and comments. It is ideal to conduct a survey on searching the hot topics of the month. You can even ask your readers what they actually want in a blog. What they want to read about. 25. Learn from the best. There are many blogs written on similar topics. You can learn from them and can get ideas about the content. Including these, there are many more ideas for improving the blog and its content quality. The immense importance should be given to selecting the writing topic and the keywords you're used to be included in it. It is ideal to make the content innovative, useful, to the point, catchy and readable. The content with visuals like photos and images can be a feast for readers. Improving the content is always necessary so as the readers can prefer reading it. It is thus obvious, to present the content, the way reader like to have. It is also necessary to make the content viewed to more and more people.